For those who didn't download the Robert Moses Parkway North PDFs from our website, Monday's State Parks-sponsored open house was an opportunity to see the concepts for the first time. And for those who did access the electronic files, Monday's event was a chance to ask questions about the six designs, which range from complete parkway restoration to complete removal. "They seemed to have done a good job," said Bob Baxter, a member of the Niagara Heritage Partnership. He called the six proposals, produced by Parsons Transportation Group, "very thorough." "We were just trying to start with the two extremes, and then looking at what was in between," said Parsons Project Manager Thomas Donohue. "What we're trying to do now is get feedback from everybody." The six proposals are the result of two prior public input sessions and the project objectives devised by the state Department of Transportation, USA Niagara, the City of Niagara Falls and the state Office of Parks, Recreation and Historic Preservation. Review and revision of the designs is part of the scoping process, which is expected to finish in December. "Our consultants did an excellent job," said State Parks Landscape Architect Andrew Giarrizzo. Parsons received a total of 355 comments (179 from individuals, 186 pieces of correspondence), which were catalogued and available for review at Monday's meeting. Giarrizzo said Parsons was very creative in interpreting the data and formulating the six current proposals. Alternative one is the full, four-lane restoration of the Robert Moses Parkway. Number two is the completion and updating of the pilot project, which is the roadway's current configuration. •Main Street to Cedar Avenue - Remove the roadway segment between the Discovery Center and the Aquarium of Niagara and replace it with an "S" curve to Third Street at Cedar Avenue. Remove the pedestrian overpass between the aquarium and Discovery Center; connect the facilities with a landscape of broad walks and native plants; accent with interpretive features. Design the multimodal trail to service both facilities. •Cedar Avenue to Findlay Drive - Remove Whirlpool Street from Cedar Avenue to Findlay Drive. Curve Whirlpool Street at two locations to the lower level (where the two-way road currently exists). Bring the road into the Orchard Parkway overlook. Loop Orchard Parkway with Pierce Avenue; connect the neighborhood to the overlook and multimodal trail with pedestrian crossings. Connect city sidewalks to the trail. Remove the Whirlpool Bridge overpass. Provide gorge trail and overlook parking near Whirlpool Bridge. Expand plantings in mowed lawn areas. Design a new entry feature to the gorge area parks at Findlay Drive. •Findlay Drive to Devil's Hole - Retain the existing two-lane park road and multimodal trail. Connect neighborhood streets to the park road. Design a minor entry feature at Whirlpool State Park. Establish safe pedestrian route/crossings from the DeVeaux neighborhood to the multimodal trail. Design a standard roadway intersection including stop signs and directional signs at Devil's Hole. Remove ramp lanes and simplify the layout of the gorge side parking lot. Remove the Lewiston Road parking lot and pedestrian overpass. Restore with soil and native plantings. •Devil's Hole to Lewiston-Queenston Bridge - Convert the northbound lanes to two-way traffic. Convert the southbound lanes to a multimodal trail. Clean up (repave, stripe, sign; remove fences, barriers and rails where not needed). •Bridge to Center Street - Continue the two-way park road and multimodal trail to Center Street on existing pavement. Design an escarpment overlook to include the multimodal trail and car parking. Terrace the seating area above the parked cars for an unobstructed view. Establish safe, lighted and paved pedestrian route crossing(s) from the gorgeview neighborhood to the multimodal trail. Remove obstructions. Connect the rail bed trail from Niagara University to the multimodal trail. Remove the gorgeview portion of railway bed trail. Replant. Maintain vehicle exit lanes as constructed in 2011 from Artpark to the park road as egress for departing event patrons (only on Tuesday nights). At Center Street, transition the two-way park road into the four-lane RMP. •Findlay Drive to Devil's Hole - Meander the alignment of the parkway within the area already disturbed and occupied by southbound and northbound pavements in order to create a more curvilinear and interesting park road. Design a new, 13-foot-wide (more narrow) multimodal trail. Connect neighborhood streets and walks to redesigned park road and multimodal trail. Transition the park road onto Lewiston Road at Devil's Hole with a roundabout. •Devil's Hole to Lewiston-Queenston Bridge - Redesign the interchange at the bridge and Lewiston Road by removing the four overpass structures and bringing everything to ground level with a roundabout. Restore ground areas with soil and native plantings. Design a new, 13-foot-wide multimodal trail in the former RMP corridor. Connect said trail to the NU rail bed trail. Create a gorge/bridge scenic overlook with parking. •Bridge to Center Street - Convert the northbound lanes from the bridge to Center Street into a two-way park road. Remove the southbound lanes and design a new, 13-foot-wide multimodal trail in its place. Design a terraced escarpment scenic overlook with the seating area above the parking area. "We obviously favor a combination of three and four," said former Village of Lewiston Mayor and current 12th District Niagara County Legislator Richard Soluri. A member of the Parkway Preservation Committee, he added, "It's best for the region. It's best for economic development. It's best for visitors. "It protects the large investments that have been made to Lewiston and Youngstown and beyond." Lewiston resident Zach Collister said option three "is the best aesthetically and it still connects all the communities." He described it as an "educational parkway" plan that would direct visitors from the aquarium and Discovery Center to Artpark and Old Fort Niagara. Collister said it's important that Niagara Falls, a tourism-based city with hotel rooms to fill, have direct access to Lewiston and its attractions (Artpark, Whirlpool Jet Boat Tours, historical buildings/events). "It's a community that supports a community. ... The Robert Moses Parkway connects everybody," he said. Alternative five is "Whirlpool Street with divided park road." It calls for one lane of traffic on both sides of the RMP, and one lane of natural surface. The sixth alternative, and the one the Niagara Heritage Partnership favors, is full removal of the parkway. Baxter said this concept is "the only option that permits the realization of the vision presented by the Niagara Heritage Partnership over the last 15 years." With a parkway, he said, "You eliminate every positive potential that we've worked for." Baxter said keeping the road means pulling people away from the City of Niagara Falls. Moreover, he said there would be no opportunity for ecological restoration or implementation of a greenhouse or other nature-observing entities. In short, Baxter said keeping the roadway would result in fewer tourists. 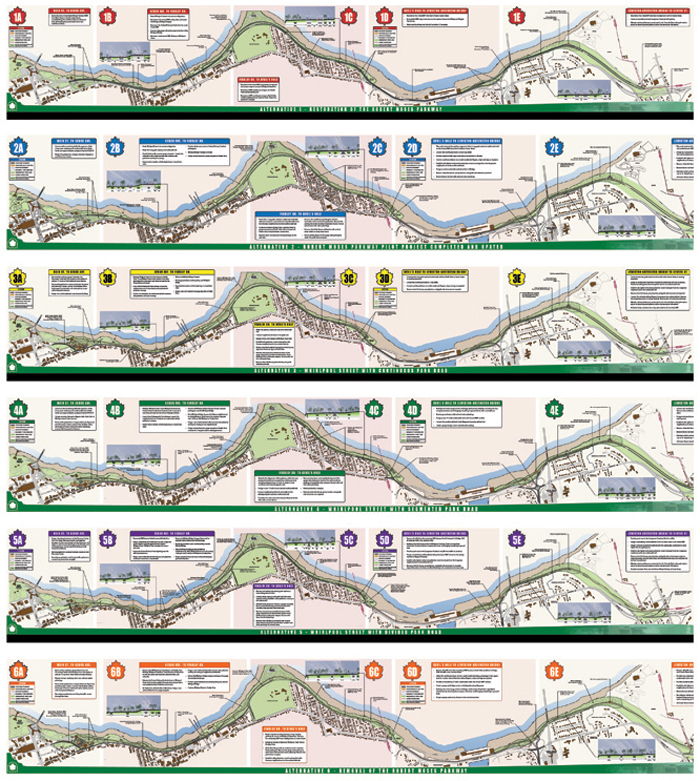 Those in attendance Monday - and those who visit the State Parks website - are encouraged to view the six alternatives, grade them, and return comments by July 8. Those three or four alternatives with the most favorable comments will continue on in the scoping process. Following preliminary assessments, Giarrizzo said the draft scoping report is expected to arrive in August or September. Once the scoping process is finished, a detailed study will be created and discussed at a public hearing. The final step is a record of decision. In a best-case scenario - and assuming state and/or federal funding is in place - Giarrizzo said a final action could take place in about two years.